I'm not saying that their season will be a complete write off and I'm sure the usual people will jump to their support but it is getting a bit silly now. I understand that it is testing but at the end of the day, it isn't like it is a recurring issue. It seems to be something different every time they have a break down. Yes, other teams have had issues here and there but McLaren are having an absolute nightmare. It is depressing for Alonso and Vandoorne, and a real shame. As you say, they might sort it out, but either way they're massively on the back foot, and as usual Merc are leading the way. There's nothing really to suggest at this stage that anything will be different from last year. Mclaren are doing an engine change, it was an oil leak that caused the stoppage. McLaren not having much luck with their engine suppliers, it seems! So spectators don't get their pit walk because there is no lunch break to compensate for lost testing, but nobody is actually testing during the cancelled lunch break hour? Sounds as though it was the teams who requested it too which is just F1 in a nutshell really. Yeah but they also need some fuel just like their cars! Of course they do. 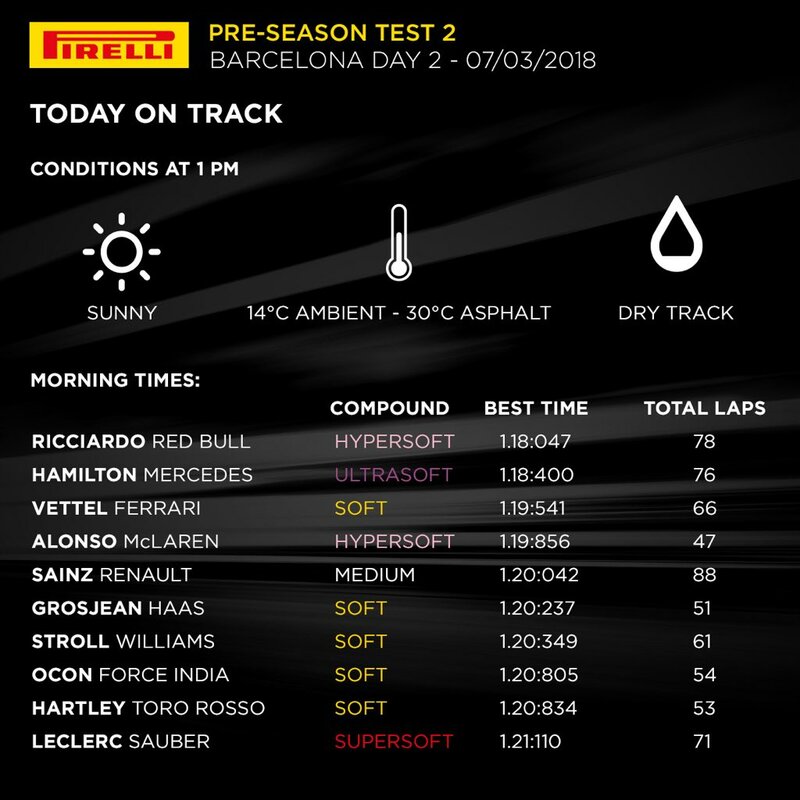 Just a bit ridiculous that the teams pushed for having no lunch break so they could test (with the implication that there would be no pit walk for spectators), then don't test at all. 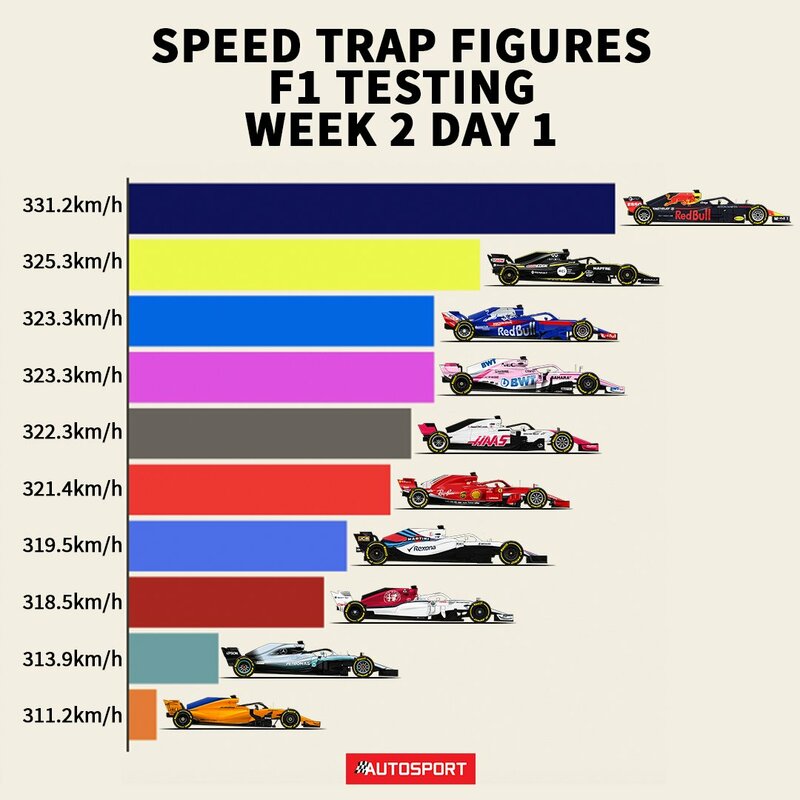 I seem to remember that quite often last year Haas had the fastest car in the speed trap but that didn't equate to particularly fast lap times. I'm beginning to think that McLaren should put in a bid for supplying the FIA Medical Car. They seem to have become experts in developing a car perfect for following the rest of the field. Speaking of McLaren, they said 5 hours ago that they would repair the car in 3 hours & send the car back out again. Seems the clock in their garage has stopped. McLaren cant seem to get a chance! I think it interesting how many people are referring to Toro Rosso as Honda across several threads. I guess that's what happens when a junior team pairs with an embattled power unit supplier. I wonder if it would've been different if Sauber hadn't nixed their Honda deal. Question for the people jumping on Macca for their reliability issues at the test: How does McLaren cause Renault to provide them a bad battery, and how did they cause their Renault engine to spring an oil leak? For a battery problem and an oil leak, yeah I would. Just like I'm blaming Renault for both of those now. They're power unit problems, meaning they're the fault of the PU supplier. For the bolt failure, no, I wouldn't have blamed Honda. Not saying that's the case, but why couldn't insufficient cooling cause both battery and engine issues? I'm sure it could cause some engine issues, but I don't know that it would cause an oil leak specifically. The overheating issue they have - when it surfaces - seems to just cause burn marks on the engine cover and force them to stop running. I assume the oil leak was unrelated, since they didn't attribute it to overheating. As for the batteries, I agree that overheating could have caused those to fail - but since Renault has said outright that they were bad batteries (and RBR had the same problem) that one was purely rhetorical. We know it wasn't McLaren's fault. I don't know the exact condition and fuel loads, but what is good is that it seems that Mclaren can turn it up quite quickly. It does seem that their approach isn't necessarily outright pace, rather than the ability to be on/off as the conditions require. I still believe with the package they are bringing to melbourne, they think they have something up their sleeves and don't want to risk any possible protests. Yes, I think (hope!) that as well. That's really the only reason for not having it on for testing, so they must at least think they've found something good! Did you see the Amazon documentary from last year? My faith in Mclaren's ability to deliver working parts on time took a big hit. I don't think I blame the testing issues they've had completely on Mclaren themselves, but I think expecting that they are holding back a silver bullet for Melbourne is being a bit overly hopeful IMO. vettel getting vast majority of ferrari testing. again. pathetic ferrari. illness involved or not its just pathetic. looks like kimi has lost the half day from yesterday if vettel tests all day. wonder if vettel would have lost a half day if hed been ill. of course not they would have taken it from kimi. 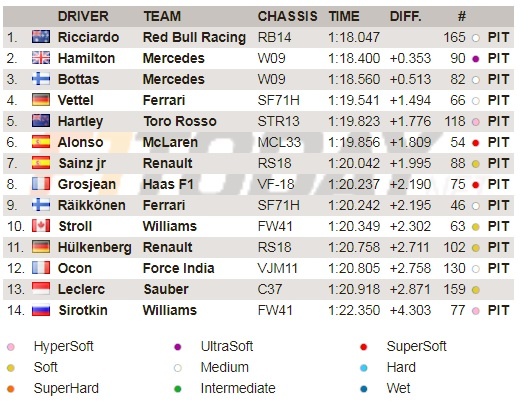 Looking at the times being set so far, it seems that the field is a lot closer together than it has been for quite a while, it might just be because it's only testing but it would be good if this carries on through the season. You are too far on this. I think it's a development path, not necessarily a magic part. If they bring it now, the other teams will protest it or follow it either way. If they bring it in Melbourne and the team is reasonably quick but not a silver bullet, nobody will care. Big boys still not showing what they've got. 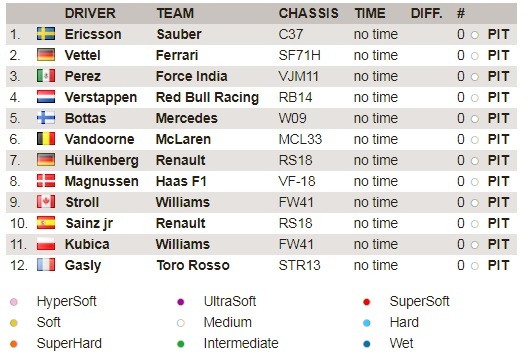 Magnussen just did a 1:18.5 on supersoft tyres and on his inlap he did a green and purple, so he could go faster still. And Mercedes and Ferrari should be quite a bit faster again but for now now showing it. OK, I'll bite. Are there logical reasons for giving Vettel more time? Does Kimi like testing or not so much? Is his feedback as good as Vettel's? is he still not feeling terribly well after yesterday? With last year's championship being closer than expected, would it not be logical to make sure your #1 driver is geared up as best as possible? Bit unfair that isn't it? Ferrari have said they are allowing Kimi to fully recover for tomorrow's full day of testing. Sounds to me like he's not fully recovered from his illness. And not seen anything from Mclaren for a while? ?